I started a series of physical world paintings called, “The Quiet Days of Digital Trees’, which of course started with just one tree. 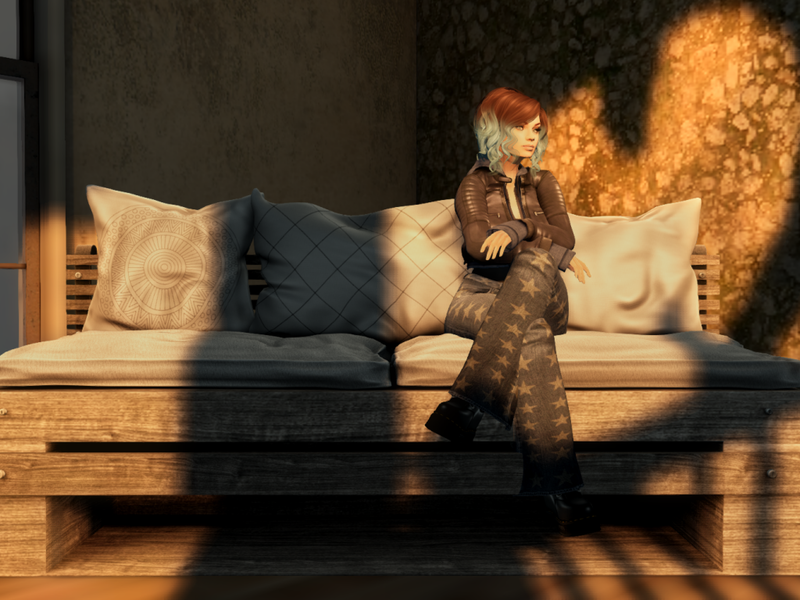 I took inspiration from this photo that I had taken in Second Life one day when I was exploring the Anduril sim. I have always had a thing for trees. I don’t know what it is or why I keep coming back to them. I did an environmental science degree because of my love of trees and forests. My online name has always been Mangrovejane, named of course, after that tidal zone tree, the Mangrove. So when I was considering doing a painting just to get back into the swing of doing some physical art work again…it wasn’t really a surprise to anyone that I would choose a tree as my subject. This particular tree was done with a deadline in mind. I finished the painting in just under 10 days. I always like my paintings to be highly textured. I work in acrylics, so this means that I also need to work with a lot of texture paste in order to get the detail I need. I like them to be almost sculptural, reaching out of the page as if they are almost real…without being quite so realistically painted. They need to have almost a dream like quality to them…as if they are dream trees. However this led me to the thought that is constantly on my mind at the moment about playing with reality. I play with the idea of reality constantly throughout my postgraduate studies. I wonder how far we can bend someone’s perception of it and how our online presence becomes its own reality. I examine those images in online worlds that are used to construct, maintain and manipulate our online realities, and so this simple image of a tree has become something else. By giving it a physical presence as a painting out in the “real world” it acts almost like a bridge between realities. This concept led me further, looking at the traditional landscape paintings and in particular, how the tree itself is a large part of most traditional western landscape painting. I thought it would be interesting to play around with the idea of the traditional landscape tree using photos of trees and landscapes I have taken in the online world of second life and present them as physical world paintings. Then to take that a step further…to photograph those paintings of trees and exhibit the photos of the physical world paintings back in Second Life exhibits. I won’t lie…the process takes a little while. When all the pieces are together, they form a forest, each one having its place among the 12. They will all be different sizes just as the original trees also are. But each piece is also designed to stand alone. Add into that original concept two other things that have impacted the conceptualisation of this series. Firstly, I was commissioned to do my next tree based on a paperbark tree. This is a tree with everything I love about it. It has a beautifully textured bark and a lovely form. It is something that the client wants to go up in their public music studio…and it is large (152.6 x 76.3cm). I can SEE the finished painting in my head. And I can see it as part of the series, but the contention here is that the original source material is not digital…but in the process of making the tree, I will have turned it into something digital through the use of photography rendering it back into pixels. It made me consider that not all the trees needed to come from digital sources and that, in fact, it may play with the concept of reality a little more if they were NOT all from the online world and the viewer did not know which ones were or were not. Secondly, I have been working on recording sounds and soundscapes. This made me consider the sound of digital trees and how that world is actually quite silent. 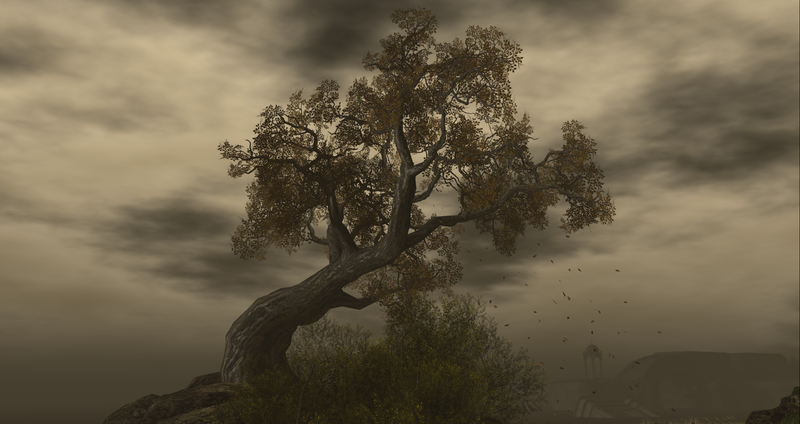 There are no sounds of wind brushing through leaves or the rain falling onto leaves or even the creaks and pops of the trees themselves as they grow throughout their day in the online world of Second Life. So, I sort of imagined what that sound world would be like and what the day of a digital tree would sound like and I wanted to add that to give the paintings a sense of almost an augmented reality. I wanted the trees to talk and to live in spaces that sounded like it had life and in this way add another layer to the twist on reality I am working through. I am currently doing a prototype to make these paintings of trees interactive with sound so you HEAR their days which will be a constantly looping ambient sound. On top of this, will be a sound triggered by two things…proximity using conductive paint so when you reach to touch the tree, the sound of the tree itself will be heard getting louder, the closer you get to the tree. Secondly, when the series of trees are together, they will trigger each other to talk. So, for example, if one tree is triggered by proximity, it will trigger another tree in the series to talk back…and this tree will trigger another until the set is talking in a chorus. Eventually, I would like to stitch together 24 hours recordings and set it to time to the actual physical time of day so that at dawn, for instance, you hear the dawn chorus of birds and at dusk you hear the gradual changeover from birds to nocturnal creatures. The tree in the original painting (The Quiet Days of Digital Trees 1.0) is set to become my prototype. I have to add black conductive paint to it and I am hesitating to apply the paint to the canvas as I like this painting just as it is…and as soon as I apply that paint to it, it will forever change this particular painting. I can’t just be some simple light dry brushing of the paint to the surface either…it needs to be an unbroken shape of it leading to the bottom of the painting and around to the back so I can attach the wires to it. I DID want to repaint some of this painting to cover some of the flaws that have showed through the more I look at it…but this is an extreme touch up that I KNOW I have to get to in the next couple of days in order for it to be ready to show as a prototype. I also know I can paint over it if it really doesn’t give me the look I want in the end. But…just…for now…let me have this moment of artistic fluttering and panic and I promise I will get it done tomorrow.